Little ones can find big numbers confusing. 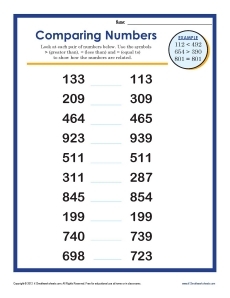 Help them de-mystify three-digit numbers while practicing using the "greater than" and less than" signs. The worksheet is helpful for 2nd grade Common Cores Standards for Number and Operations in Base Ten, but other grades may use it as needed.